Cora Josephine Turner's Early Illustrations for the "Lounger"
In "A Girl in the Art Class" by Jan Gordon, Cora Josephine Turner ("Raymonde Carpenter" in the book) decided to make "a raid on Fleet Street." She aimed to visit the editors of magazines in Fleet Street and Covent Garden, seeking work as an illustrator. "I walked along the street and when I saw the name of a paper went in." The editor of the Christian Post gave her tea and then wrote out "several addresses more promising of business than himself.." Eventually there was some success: ".. from the editor of the Lounger I received a commission, and went away from that journal overjoyed, with a real galley proof in my pocket." Considering synonyms of "lounger" leads us quickly to the identification of this magazine as "The Idler," a British monthly magazine published between 1892 and 1911. Later, "Raymonde" "had been working industriously on the illustrations for the Lounger. The subject suited my fantasy, though for one picture which represented the interior of a chemical laboratory I was rather at a loss. However, I walked haphazard about Paris until, finding a shop of chemical glass, I went boldly inside and, with my most ingratiating smile, asked to be allowed to make some drawings." "The lounger had already written back approving of the drawings, and had enclosed the galley-proof of another story. I felt that the gates of success had opened at least a crack." Delightfully, a search for "C.J. 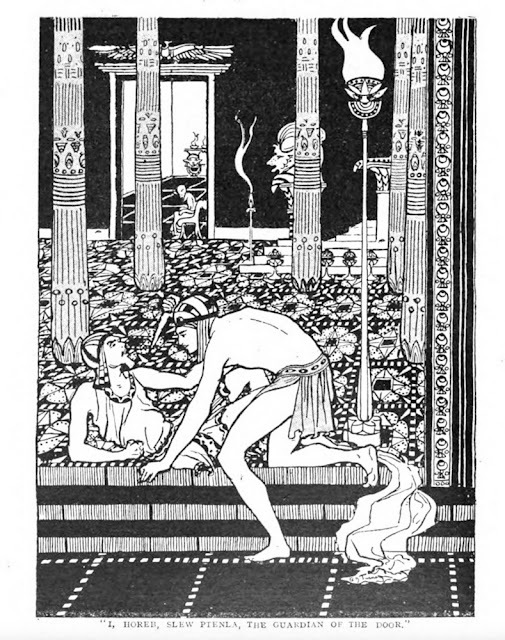 Turner" in editions of "The Idler" reveals a story by Edwin Wooton "illustrated by Miss C.J. Turner," these presumably being that first batch of approved drawings, once again demonstrating the basis of true history to the narrative in "A Girl in the Art Class." 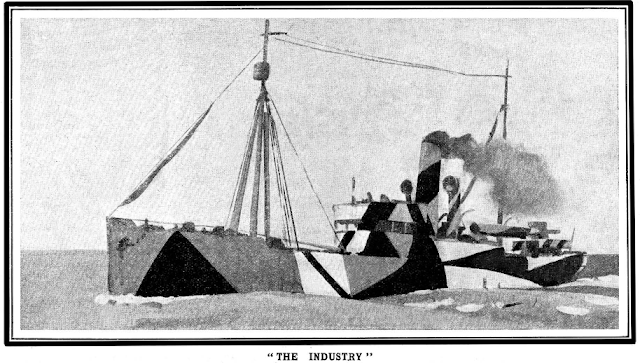 Despite that first batch of drawings being approved, "The Lounger magazine had paid neither for the first nor for the second set of illustrations. Letters to the paper had elicited no reply." "I, Horeb, slew Ptenla, the guardian of the door," illustration by C.J. Turner, The Idler, May 1909, page 216. Cora Josephine herself was disparaging of her efforts for the "Lounger." 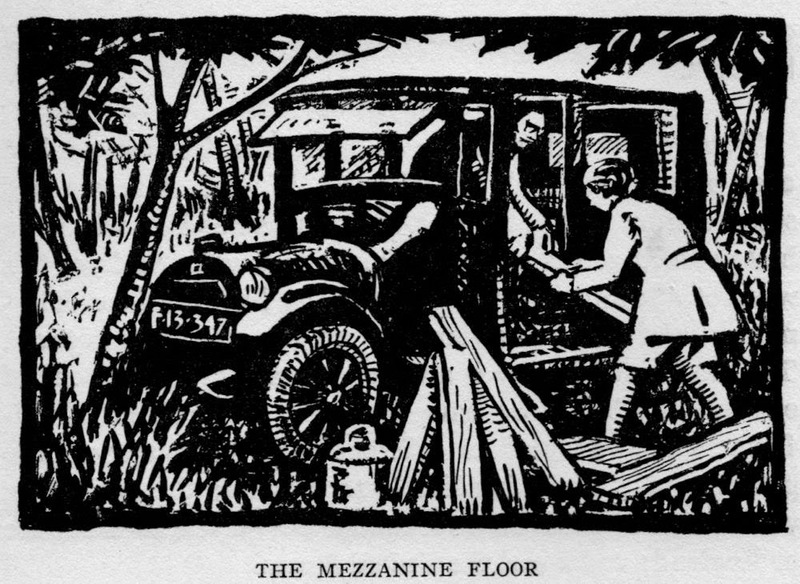 She had "finished the second set of illustrations for the Lounger and had sent them off, with a note that a cheque in payment would be most welcome; but .. had no answer, nor any new manuscript from the editor. I look back on those illustrations now and am astonished at their ineptitude. I am astonished that, with the knowledge I possessed, I could have let them go from my hands in such a condition. I might also be surprised at the number of bad drawings and etchings that I drew, interspersed with a few of credit, if it were not that I can distinguish between the different impulses that drove me to do the ones or the others. A great handicap in the advance of the young artist is that he is incapable of judging his own work ; what he hoped to do overlays what he has done, even can create hallucinations, and the more inept the artist, the more vivid these hallucinations may be, so that in his eyes the daub seems almost a masterpiece."